Chandigarh, November 1, 2018 : How does one define the concept of customer loyalty at a time when customer retention is fundamental to telecom service providers? Connect Broadband recreates the concept of customer loyalty at a time when customer retention is fundamental to telecom service providers. As the No. 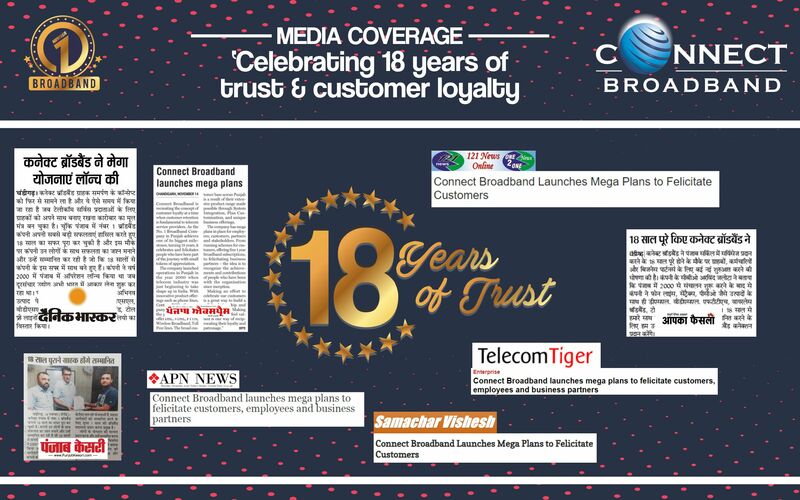 1 Broadband Company in Punjab achieves one of its biggest milestones, turning 18 years, it celebrates and felicitates people who have been part of the journey with small tokens of appreciation throughout the month. Connect launched operations in Punjab in the year 2000 when telecom industry was just beginning to take shape up in India. With innovative product offerings such as phone lines, Centrex, PCOs, the company further expanded the product portfolio to offer DSL, VDSL, FTTH, Wireless Broadband, Toll Free lines. The company’s broad customer base across Punjab is a result of their extensive product range made possible through System Integration, Plan Customization, and unique business offerings. The company has mega plans in place for employees, customers, partners and stakeholders. From running schemes for customers, offering free 1 year broadband subscriptions, to felicitating business partners – the idea is to recognize the achievements and contributions of people who have been with the organization since inception. Arvind Jalota, Chief Business Officer, Connect Broadband said, "We are reimagining and recreating the concept of customer loyalty. Making an effort to celebrate our customers is a great way to build a solid relationship and increase loyalty. Making our customers feel valued is our way of reciprocating their loyalty and patronage."